Find out how to build a DIY greenhouse in your yard to keep your plants warm when the temperatures drop, and to give you a head start in spring on growing seedlings to plant in your garden. Watch this video and read the article to find out how it’s done. A shed can be much more than a simple utility building for storing lawn equipment. 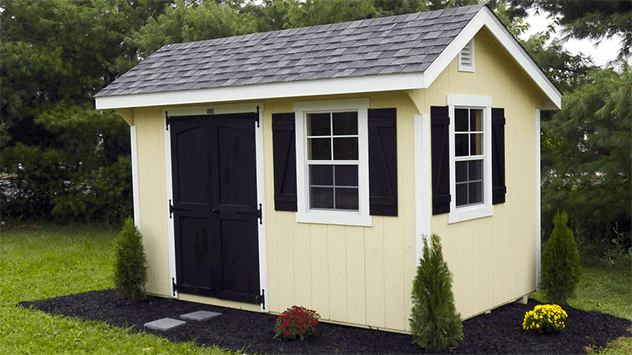 These attractive and well designed sheds from Better Barns in Collinsville, Connecticut, can be used as a workshop, gardening shed, artist’s studio, or child’s playhouse. Watch this video to find out more. The simplest way for a DIYer to build a foundation for a shed is by creating what is known as an on-grade foundation. Unlike a foundation with poured concrete footings, an on-grade foundation is constructed by stacking solid concrete blocks directly on the ground. Watch this video to find out more. Even though sheds are small structures, they still have to be approved by your local building department, receive a building permit, and follow building codes during construction. In addition, if you may have to comply with local neighborhood covenants. Watch this video to find out more. Before building a garden shed or workshop in your yard, decide on the answers to these questions: How big should the shed be, should the design of a shed match the house, and where should a shed be built? Watch this video to find out more. Storage sheds can either be built from scratch, made from a kit, or delivered to your house preassembled on a truck. When ordering a preassembled shed, be sure you have enough vertical and horizontal clearance to fit and unload the shed in your yard. Watch this video to find out more. While the garage is a great place for storage, it often becomes cluttered, making it hard to find what you need. Here are some easy projects to allow you to get even more storage space out of your garage while keeping it organized.